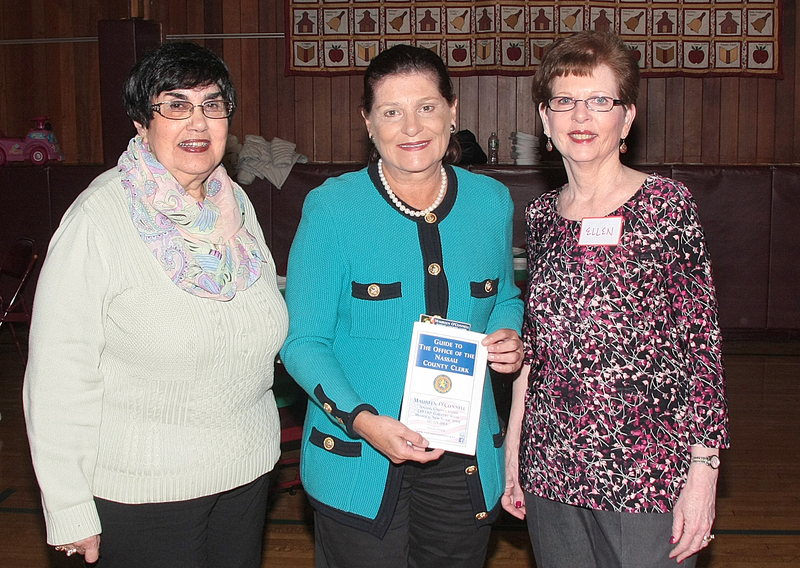 (Mineola, NY) Nassau County Clerk Maureen O’Connell recently joined a meeting of the Young at Heart Seniors Group at Grace Episcopal Church in Massapequa to speak with members about the services the Clerk’s office provides to residents including the processing and maintenance of the County’s land and court records. Another service discussed was the recording of Veteran Certificate of Release and Discharge (DD-214) papers free of charge. As an incentive for veterans to take advantage of this service, Clerk O’Connell talked about the Nassau Veterans Recognition Program which offers them discounts at participating businesses throughout Nassau County for recording their discharge papers. The Clerk’s office also accepts and processes passport applications. Clerk O’Connell urged residents with travel plans to make sure they have their passport in place.